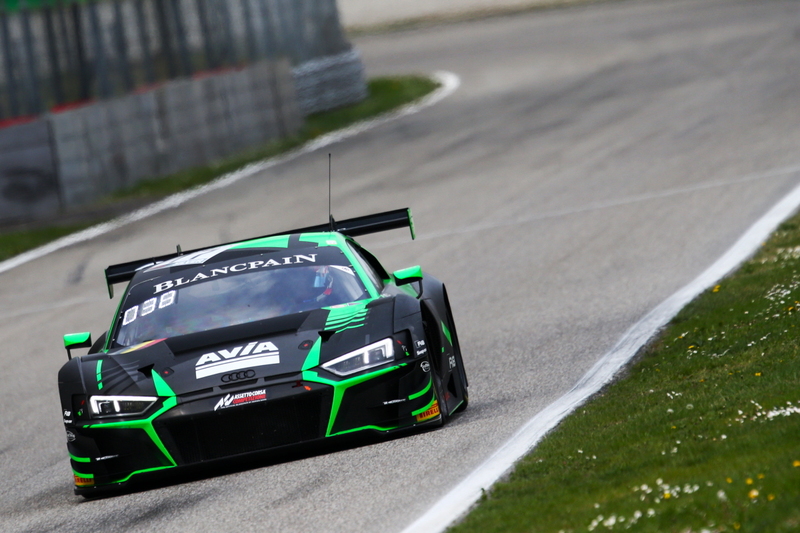 Blancpain Endurance Cup debutant Alex MacDowall endured a vexing start to his career in the globe’s biggest GT3 championship at Monza in Italy on Sunday, 14th April, when qualifying dramas for one of his team-mates meant the Cumbrian driver didn’t even have the opportunity to race. Moving into the prestigious Blancpain category this year after completing an eleventh hour deal with top team Belgian Audi Club Team WRT, MacDowall’s hopes of making a strong start to his first event piloting an Audi R8 LMS GT3 EVO unraveled through no fault of his own. Heavy and persistent rain on Sunday morning led to an extremely wet and slippery track surface for the grid-determining qualifying session, where the Carlisle driver was scheduled to run during the third of the three sessions. Team-mate Shae Davies took the opening run and delivered a time of 2m13.205 seconds, 11th fastest in the Silver Cup class, in a session interrupted by two red flag stoppages due to separate incidents. Paul Petit then climbed behind the wheel of the No.17 Audi R8 for the second 15-minute session which, again, featured a red flag a third of the way through. Shortly after the resumption of qualifying, though, everything went awry for the Audi team-mates when a car ahead of Petit braked suddenly on the straight when red flags were shown. With nowhere to go, and no time to react, heavy contact was inevitable. Within minutes of the car returning to the pit garage the team confirmed it had to be withdrawn from the remainder of the race meeting due to the chassis leg behind the crumple zone being too badly damaged. As a result, of course, MacDowall wasn’t able to run in the third qualifying session and all three Team WRT drivers became spectators for the subsequent three-hour encounter. While frustrated for his 2019 season to begin in such a fashion, the British racer is putting his focus squarely on the next round on home ground at Silverstone. “In the wet we had quite a nice balance with the Audi so when it was wet for qualifying, and it looked set to be wet for the race, we had hoped for a good result”, said the 2018 European Le Mans Series LMGTE Vice-Champion, “Obviously, after the incident Paul had – which couldn’t be avoided at all as the closing speed was too much – the chassis leg had taken too much damage to be repaired. MacDowall will look to get his Blancpain Endurance Cup campaign properly underway four weeks from now when round two of the 2019 season takes place at Silverstone Grand Prix Circuit in the UK over the weekend 11th/12th May. LUCKLESS START TO BLANCPAIN ENDURANCE CAREER FOR MACDOWALL AT RAIN-LASHED MONZA .